This week our President (François Hollande) is heading West, towards the United States and more precisely towards Silicon Valley, where a lot of young French entrepreneurs moved to create or work in start-ups. He goes there to learn from the local eco-system, but also to try to collect a few dimes from the digital giant such as Google or Amazon... I though that posting a photo of one of the "founding fathers" - and the 3rd President - of the country was appropriate. 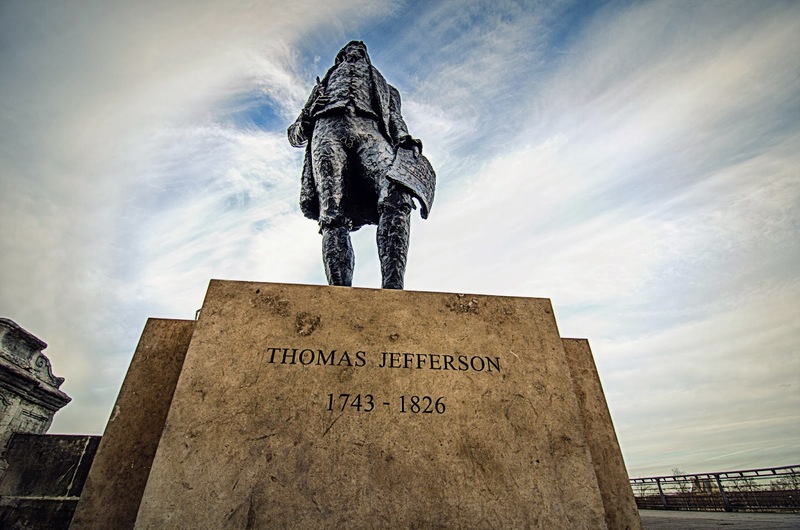 This statue of Thomas Jefferson is actually at the end of the Le Pont des arts Passerelle Léopold Sédar Senghor on the left bank. Too bad you just got back from a long trip. You could have gotten yourself on the journalist entourage and come for a visit. Then we West Coast (sometimes called the Left Coast) would have been able to swoop you up for an evening out. Ah well. Next time. No joke about the French entrepreneurs in Silicon Valley. There's a whole LinkedIn group of them. Yes I know, I know a few; there is a pretty large French community over there. Le Pont des arts? ou la Passerelle Léopold Sédar Senghor? Ooops, you're right Tim, my mistake. I edited the caption! Thank you. Several of our founding fathers, chief among whom were Jefferson, Franklin and Adams, spent productive years in France. You crack me up Judy! This shot is especially apropos today—when Messieurs Hollande and Obama will be touring Jefferson's home, Monticello, together.